Image shows our 1 gallon can of stain & sealer. Ideal for use on wood based cabinets, outdoor furniture, wood fences or other outdoor structures, wood decks, log homes, indoor furniture, trim, fiber cement, wood floors or other wood based surfaces. 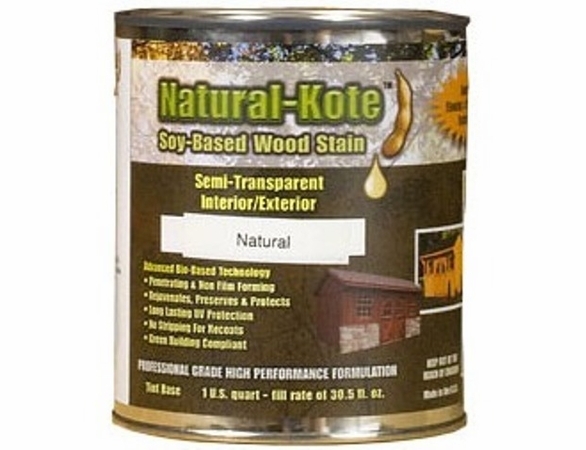 Our Natural-Kote Wood stain & sealer is an all natural soy based stain. Soy-based products lead the industry in providing a non-hazardous penetrating stain. This proprietary formula is made from renewable resource materials and makes it a preferred environmentally compliant. 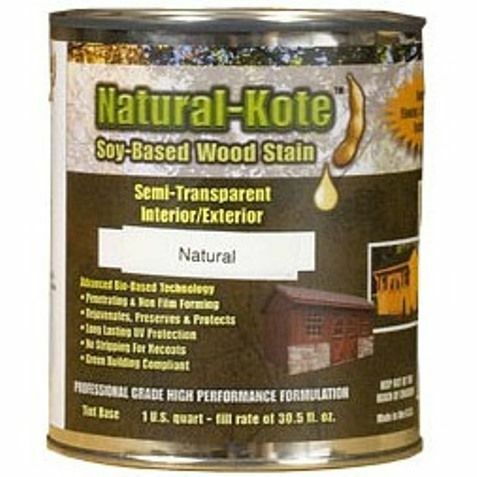 Natural-Kote rejuvenates, preserves & protects wood surfaces. The natural function of the soy acts to replace the sap for dried woods providing a longer lasting finish. 1 Gallon of stain covers 350-400 square feet. Decks will soak up the stain. It's our recommendation to go up a gallon when figuring this kind of structure. A normal size deck would take approximately 5 gallons. One chair or planter would only need a quart. 6' Table you'd want 2 quarts. 8' table would take 3 quarts. With this product there is no need for a sealer as this contains a specially formulated stain as well as sealer all in one can. * When a quantity of more than 1 is ordered, additional charges may apply. Please call for quote. "Overall I really like the stain and sealer, the number one asset being the non toxicity. It's easy to mix and apply and worked well. It's hard to say how long it will last - the deck (cedar) is on a full southern exposure with no cover at all. Conventional stains in the past have lasted only two years or so - if I get that out if this product I'll be happy. The hard sell on this product is the amount of work involved. My deck is 32 x 12 with railings and balusters the whole way 'round. Having to apply two coats of stain and them go over the entire thing again with sealer is no fun considering a conventional stain would cover it in one pass. It's literally 3X the work. Having said that - seeing my children and pets spending time out there and knowing they are not breathing in noxious off gassing chemicals is something you can't really put a value on so for me it's worth the extra effort. It would be great if they could incorporate the stain and sealer into one product - I considered trying to mix them to save some time but I didn't want to compromise my experiment with the product.